Exploring with me will open your eyes to beauty worth saving. 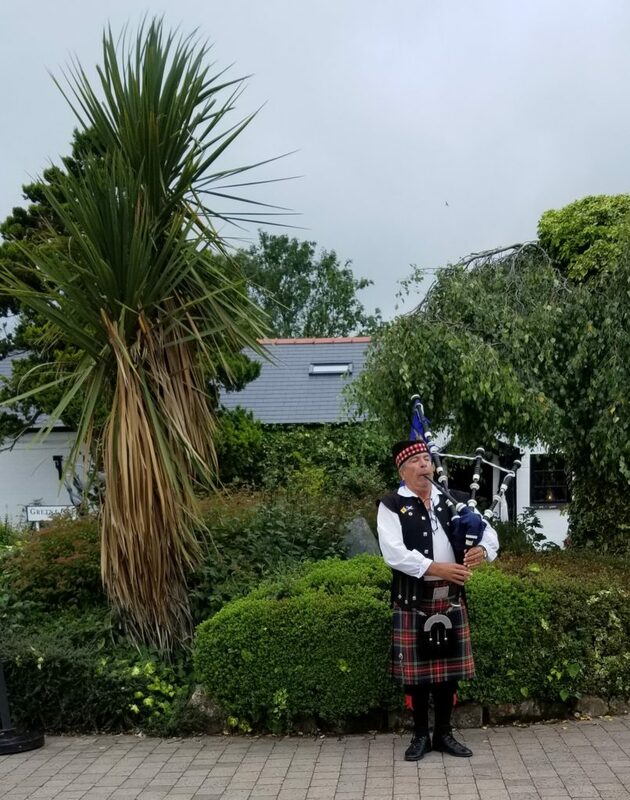 We did 10 days through the United Kingdom it was a world wind of the past and present. As I travel the streets of new place my senses explode with excitement. It is if my mind want to soak up everything I see touch or feel. I love to explore and when I’m in a city I have never been in before my mind records as fast as it can. Unfortunately I don’t have a photographic memory so I took so many photographs so I can use them as references. Besides I want a record of these countries to see the areas I might want to go back to again to spend more time. My mind is on over load, because the artistry is everywhere so many periods of time are here to take in. Exploring the art and the architecture in the castles like in Edinburgh Scotland. The castle sits high up on a hill over looking the city. Architecture so amazing that when I think about the skills of the architect, craftsmen and tools it took to create these huge structure I am inspired to step up my art work. Exploring Scotland and Ireland was a feast for the eyes. They have a competitions for the most beautiful towns, cities and country sides. So the streets are very clean, everything is immaculate with beautiful flowers everywhere. There are flowers in window boxes and in hang baskets which brings out the buildings against the green foliage and city buildings. Who would have thought they have palm trees here. Not me, but there here. The contrast of the tropical with the mountains and hilly country side fascinates and inspires me. Belfast we seen street art that expressed the freedom fighter and a resolution to a long battle between religion. The art on this wall incorporates this quote. Open your arms to change, But do let go of your values- Dalai Lama is on the top arch. Wall in Belfast that separates the two religions. Exploring Ireland you know I had to go to a few pubs this was by far the most interesting one. 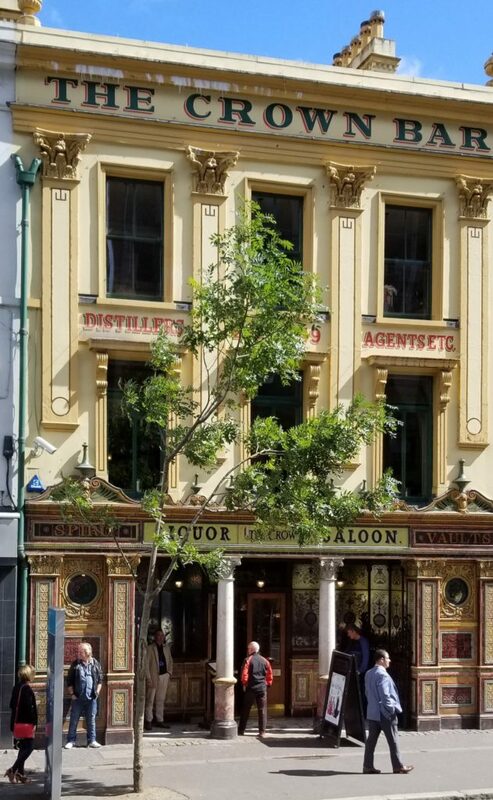 The Crown Bar in Belfast is a Victorian Designed pub. It has a large bar with 10 booths that surround the outer bar area.There is more dinning up the stairs, which I plan exploring when I go back. The interior is a creative space worth taking time to see. Opened by Felix O’Hanlon as The Railway Tavern, the pub was then bought by Michael Flanagan. Flanagan’s son Patrick renamed and renovated the pub in 1885. Just walking in the door you can see the creativity it took to design this bar. I love the details from ceiling to the floor. Ceiling tiles made of hammer bronze I think. My husband in one of the snugs or booths its tight but can accommodate 6 people. The interior of each tight snug is unique. Each one of the 10 snugs are hand crafted hard woods with mirrors or stained glass. One of the mirror in the snug. Finding things to engage my creativity is never a problem especially when I travel. When I think of the skills it took to create this Victorian space I am in all. The creativity and craftsmanship of the Victorian period is worth exploring. Through the United Kingdom.